A group of Hastings College students attended the 2019 North Central 2 District Conference for Beta Beta Beta (BBB), an honor society for biology students, on Saturday, March 30 at Reis Biological Station in Steelville, Missouri. Three Hastings College students presented research at the conference, and the chapter received an award. Sophia Pankratz, a junior from Hastings, Nebraska, presented her research and earned a second place award for best poster presentation. 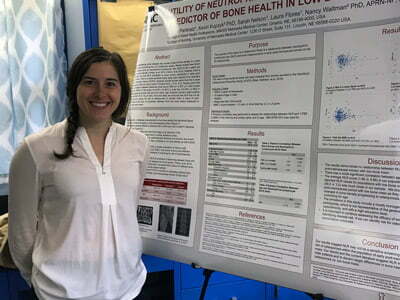 Her research, titled “Utility of Neutrophil-to-Lymphocyte Ratios as a Predictor for Low Bone Density,” was conducted as part of a Research Experience for Undergrads (REU) at the University of Nebraska Medical Center in the summer of 2018. 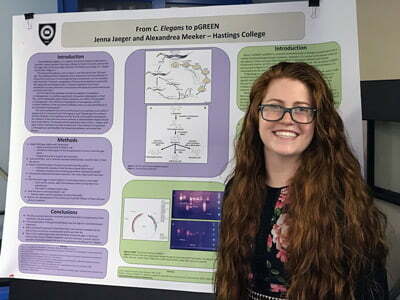 Pankratz will continue her research this coming summer. 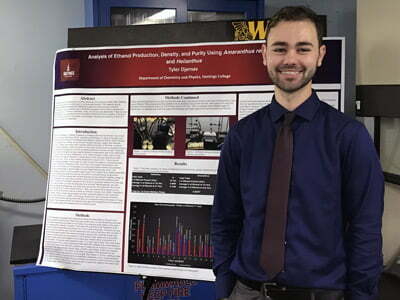 Tyler Djernes, a senior from Central City, Nebraska, presented his senior project in biochemistry titled “Analysis of Ethanol Production, Density and Purity using Amaranthus retroflexus L. and Helianthus.” He received a BBB research grant for this work. Additionally, Hastings College’s Pi Omicron Chapter of BBB won the Travel Gavel award and the Chapter History Award at the conference. Jaegar is the group’s historian and created the chapter’s eScrapbook for the History Award. Bart Hiscock, a junior from Bennington, Nebraska. Case McNally, a junior from Lincoln, Nebraska. Geena Piper, a senior from Norfolk, Nebraska. Alex Stogdill, a senior from Lincoln, Nebraska.